Home > Australia, Life, Social Commentary, Writing	> Office politics: What to do about the milk? Oh, that’s frustrating! I haven’t had that problem with my milk, but I buy an expensive vegan butter that I tuck away in the most remote, hidden corners of the fridge with my name all over it . . . only to still find that with all the non-vegan variants out there, folks seek it out and use huge chunks of it. Not just little tiny swipes, but ounces at a time! I assume this is just because they can, given all the alternatives, but it’s maddening on my grumbly days. I wouldn’t make a point to use their food! Indeed, I buy a BBQ sauce that I leave unmarked because I do like sharing some items. I actually do like the “breast milk” idea. Something I learned from my recent pumping days was that people will leave a healthy radius around milk that comes in pumping bottles. So, even apart from marking anything on it (an added bonus? ), you might find positive results by changing bottles. It would put me off – I hate goat milk, goat cheese, goat anything. Sheer brilliance. The straw alone may do the trick, particularly if the protruding bit is chewed. Love it. Thanks Jacqui! 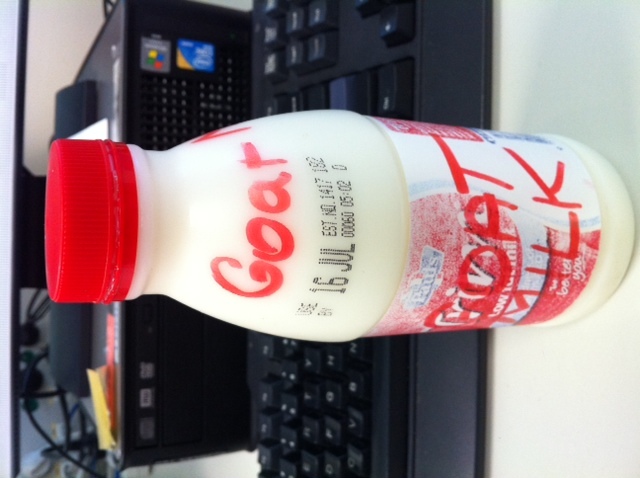 I love the “goat milk”… couldn’t stop laughing. Did it work? But try “expired” … that should definitely deter anyone from being bold enough to question it. Hi Christine – yes, the goat milk has worked thus far! “Expired” is a top idea too, except that we have fridge police here who throw out expired food along with the Tupperware it comes in!